Home ishqbaaaz Ishqbaaaz 29th March 2018 Written Update Written Episode "Shivaay's Groom Swipe Plan Rudra-Bhavya Married "
Ishqbaaaz 29th March 2018 Written Update Written Episode "Shivaay's Groom Swipe Plan Rudra-Bhavya Married "
Svetlana says Oberoi family's bad days have come, Svetlana goes on insulting all the Oberoi family members. Svetlana instigates Shivaay and says she will keep defeating Shivaay again and again since Soumya has married Rudra. Svetlana instigates Shivaay to speak, Soumya says their plan is success because of Anika, all get shocked, Anika cries. Soumya reveals that Anika stole the key from Shivaay to release her and also helped in kidnapping Bhavya. Soumya hugs Anika happily while Anika tries to explain herself to Shivaay, he stops her. Svetlana says now Kapoor sisters will watch Oberoi family getting destroyed. Shivaay tells Svetlana that there will be drama but Svetlana will become the drama. Suddenly, Omkara and Shivay start laughing, Soumya, Veer and Roop get shocked. Shivaay and Omkara declare that Rudra is married, Shivaay and Omkara dance on Dhol music, all remain confused. Soumya gets confused, Svetlana thinks they have gone mad. Tej stops them and questions them angrily. Shivaay says they are celebrating Svetlana's defeat. Shivaay asks Svetlana to see her brother in law, Soumya's husband's face, the groom turns out to be some actor. All, especially, Svetlana, Soumya, Veer and Roop remain shell shocked. 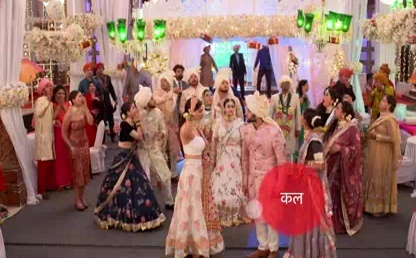 Oberoi family gets happy, Rudra and Bhavya enter as the newly married couple, Rudra dances, Bhavya enters in Doli. Rudra and Bhavya greet Shivaay, Omkara and Gauri. Anika hugs them and cries, she asks Bhavya to forgive her. Bhavya tells Anika that because of her Shivaay could find her. Ruvya take blessings from senior Oberois. Shivaay beats the Dhol around Svetlana, Oberoi family dances happily. Svetlana screams and stops Shivaay. Shivaay tells her to calm down and gives her sweets. Rudra and Bhavya feed sweet to Soumya. Soumya gets angry and declares that she doesn't believe in her wedding. Shivaay reminds Soumya that Svetlana recorded the whole wedding and sent it to the media. Soumya gets worried and wonders how their plan flopped. Shivaay reveals that Anika's Mehendi had Oye Oye written and he understood the danger. Shivaay reveals that he signaled Omkara by going to get extra flowers, Omkara says he realized that there was some problem, when they went to check Soumya, they found Bhavya. Shivaay says they made mistake by hiding Bhavya at the same place as Soumya. Omkara says they made the plan of groom change, power off, and swapping the groom during the power off.